A few years ago, my favorite technical writer/biologist and I traveled halfway across the country to visit the Mütter Museum in Philadelphia, PA. 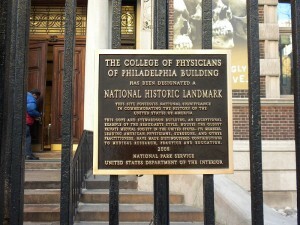 The museum is associated with The College of Physicians of Philadelphia and was originally intended as a way to teach its aspiring doctors about medical anomalies. It’s now open to the public and aims to educate visitors about medical anomalies and how the practice of medicine has evolved over time. Currently, they have an exhibit on the impact of lead on human health. It’s a fairly small museum, but has a number of really neat displays. Among the displays you’ll find a cancerous growth removed from Grover Cleveland, vertical sections of the human head and a 9-foot long human colon. It’s a pretty neat way to learn about human anatomy. Some great pictures from the museum can be found here. My favorite display is the skeleton of Harry Eastlack found in one of the downstairs corners of the museum. Harry had a disease known as FOP (fibrodysplasia ossificans progressiva), a rare disease of the connective tissues (muscles, tendons and ligaments). When a person with FOP injures his connective tissue, his body ossifies (turns to bone) the region instead of repairing it normally. People with this disease often lose coordination over time as various parts of their body become bone and fuse together. By age 20, Harry’s vertebrae had fused together and by the end of his life so much of his body had been ossified that he was pretty much incapable of movement. Fortunately for the scientific community, Harry was selfless enough to be thinking about other sufferers of FOP and donated his body to science in the hope that it would increase our understanding of the disease. Unfortunately for FOP sufferers, there is still no cure. My favorite thing about the museum was that there was a real air of curiosity and respect amongst the visitors. An environment like this could easily lend itself to lots of crude jokes, but I didn’t overhear even one. So if you’re genuinely interested in human anatomy, then I would suggest dropping in on the Mütter Museum the next time you’re in the Philly area.